After announcing plans to add electric scooters to their portfolio a month ago, MyTaxi revealed the location of their pilot as Lisbon. Customers in the Portuguese capital can rent a scooter from a fleet of hundreds. For Daimler, this may open a whole new venture labelled Hive. The pilot is new territory for Daimler and the CEO confirmed as much. 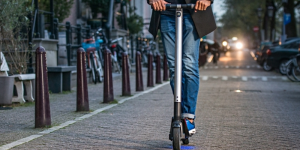 While they use electric scooters made by Segway in Lisbon, Diepenhorst stressed that it would be “crucial to develop our own hardware” especially when moving into regions with more adverse weather conditions. Indeed Hive may expand as early as next year depending on the market and the experiences they are making just now. The MyTaxi CEO also pointed to the importance of a good working relation with the respective city. He added it had been a decisive factor when opting for Portugal. To rent an electric scooter via the Hive app comes at the cost of a one euro base fee and 15 cent per minute afterwards. Half an hour thus adds up to almost 5 euros. This is the normal market rate and the same Lime in Paris is asking. The electric scooters of both Lime or Hive can be left anywhere. MyTaxi will consider to rolling out their Hive fleet of electric scooters across Europe if things work out in Lisbon. We are not sure if Hive is the right choice of names for this venture given the popularity of the Hive smart home devices! PreviousThe Battle of Tooley St – Sean Paul Day’s victory speech at Bank Junction. What If Uber Is Overvalued By 90%?